Though this film’s take on interracial romances and politics is dated to modern folks, Island in the Sun was a groundbreaking piece in its day. It wasn’t shown in the Southern movie houses, of course. 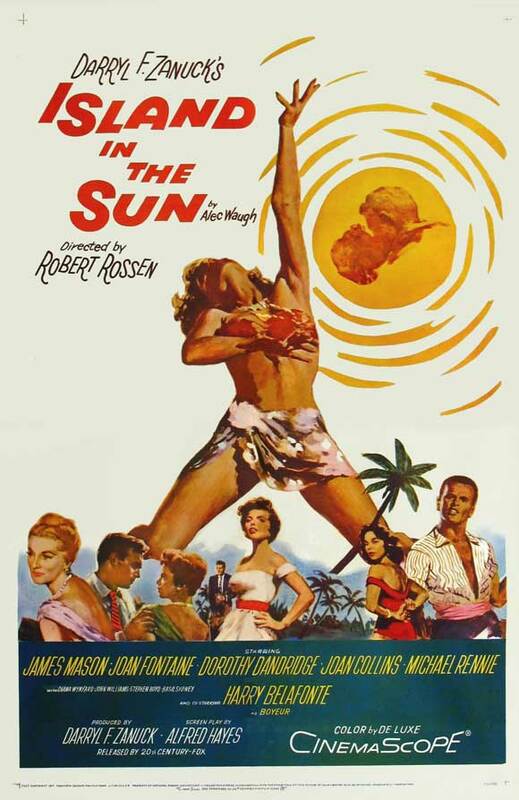 The film (which was a special project of Zanuck’s) is beautiful to look at; it was filmed in Barbados and has an attractive/talented cast (including James Mason, Joan Fonatine, Harry Belafonte, Dorothy Dandridge, Joan Collins, Stephen Boyd). However, I sense that a LOT of material was left out (or perhaps edited out) to please the censors. Mason is a wealthy French planter who wants to run for governor of the British-ruled island; his opponent is Belafonte’s labor organizer (who’s popular w/ the people). Mason’s family has been on the island for 3 generations, owns a LOT of land, and hires many to work it. Also, Mason has a jealous streak in him, fearing that his cool/elegant wife may be cheating. At a party at the governor’s house, the sophisticated Fontaine is intrigued by the idealistic/well-spoken young Belafonte, who she knew as a humble waiter in her girlhood. Dandridge, a smoking-hot local who works at a pharmacy (drug store), comes as his date. (They are old pals, not a couple.) She catches the eye of a new official on the island, played by John Justin. Unfortunately, Justin fails to create chemistry w/ Dandridge- a BIG waste! Another newbie, played by Ben Hur‘s Stephen Boyd, begins a romance w/ Collins, who plays Mason’s flirty/bored little sis. She wants to travel, see England, and meet people (as company is limited on the island). Boyd and Collins are capable in their roles, BUT most of their romantic scenes are TOO timid- another waste! I HIGHLY recommend this film; it’s like modern-day Hitchcock, directed by Polanski. 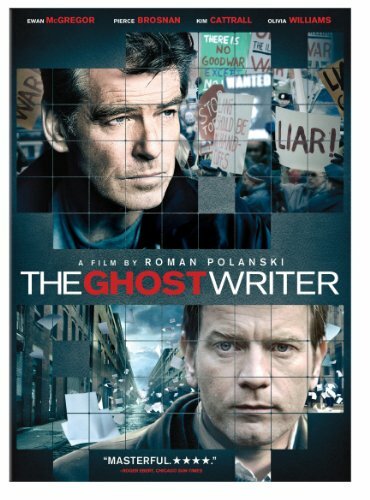 After the mysterious death (perhaps suicide) of another writer, a second ghost writer (played by Ewan McGregor) is suddenly chosen to help write the memoirs of a former British PM, Steven Lang (Pierce Brosnan). At the urging of his agent, publisher and company lawyer, he reluctantly travels from London to Nantucket (off-season). He reaches the Lang’s current home, an ultra-modern/super secure compound, after a LONG journey. First, he meets Amelia Bly (Kim Cattrall, playing a Brit), Lang’s gorgeous assistant. She says that the manuscript (which is locked up) can’t leave the compound, much to his suprise. Ruth (Olivia Williams), the brilliant wife of the PM, comes in while he’s reading the draft copy. He admits to her that the book needs work, but it’s not all bad. Steven, who prefers to run and play tennis, is anxious about something and distant from his wife. This film creates a certain (forboding) mood that is reminiscent of old Hollywood suspense films. There are NOT many characters or many things going on at once, BUT it’s VERY engaging! Williams is just a rare gem- a beautiful actress w/ a LOT of guts, strength, and screen presence. 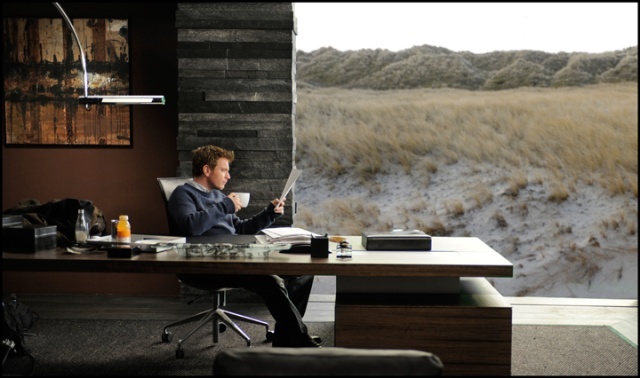 Brosnan does a FINE job, and McGregor is perfect as the somewhat skeptical/nervous/Everyman character. It was fun to see Tom Wilkinson playing a snobby American academic. Eli Wallach makes a brief cameo appearance- at the age of 94! The main issues in this film are VERY current and controversial, too.